Having accepted the invitation of the Head of State of the Central African Republic, Sir Dr. Karoly Andras Nagy, Minister of Foreign Affairs and Cooperation made a business visit as the head of delegation of foreign affairs between 2-4 April 2009 in Bangui. During the negotiations, in friendly atmosphere, the Parties overlooked the main directions of the future cooperation. On the 45 minutes audition by the Head of State, the Government of the Central African Republic was secured of full support by the Sovereign State Order regarding the social and economical development of the country. 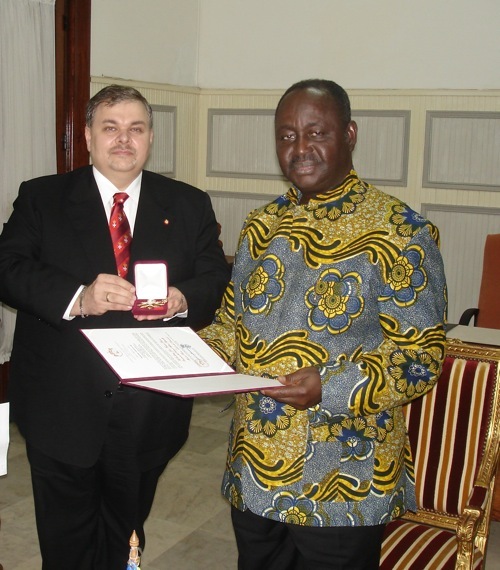 On the occasion of the establishment of Diplomatic Relations between the two States, the Minister of Foreign Affairs and Cooperation of the Order, on behalf of the Grand Master Prince José, honoured Head of State, General of the Army François Bozizé with the „Medal of Merit – Gold with Diamonds” of the Order.